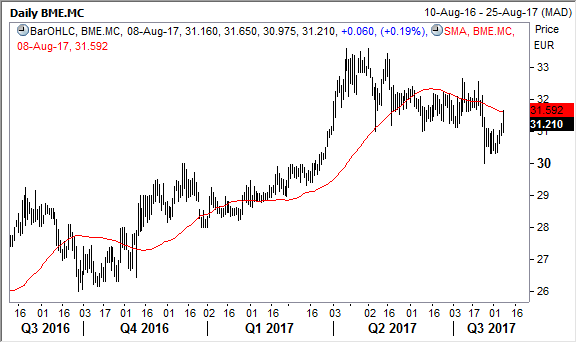 Spanish exchange group Bolsas Y Mercados Espanoles (BME) has seen equity trading volume in July increase by 4.2% on a year ago to €52.2bn. The number of equity trades was up 9% on a year ago at 4.8 million. This follows robust growth in June when trading volume rose by 11.1% on a year ago to hit €73.2bn. This was the best month since April 2016 with equity trading volume in June up by 18% from May. Cumulative equity trading volumes in the first seven months of 2017 is now 5.2% lower than a year ago at €417.1bn. Trading revenue is the key driver of BME’s business and is dependent on equity market conditions in Spain. We hold BME in the Global Contrarian Fund, Global Opportunities, and European model portfolios. Macau casino operators MGM China and Wynn Macau both enjoyed a strong day of trading on the Hong Kong bourse yesterday, rising 4.5% and 4.3% respectively. Sands China shares were also up, but by a more modest 0.8%. We hold all three stocks in the Global Contrarian Fund, and Asian Managed Account Portfolios. We hold Sands China in the Global Opportunities Model Portfolio. Bloomberg reports that speculation mounted this week that the Trump Organization might be interested in operating a Macau casino, after it was recently revealed that representatives of the group filed for trademarks in the world’s largest gambling market. These were for a variety of different uses, from construction and development, restaurants and conference facilities, real estate services and casino operations. 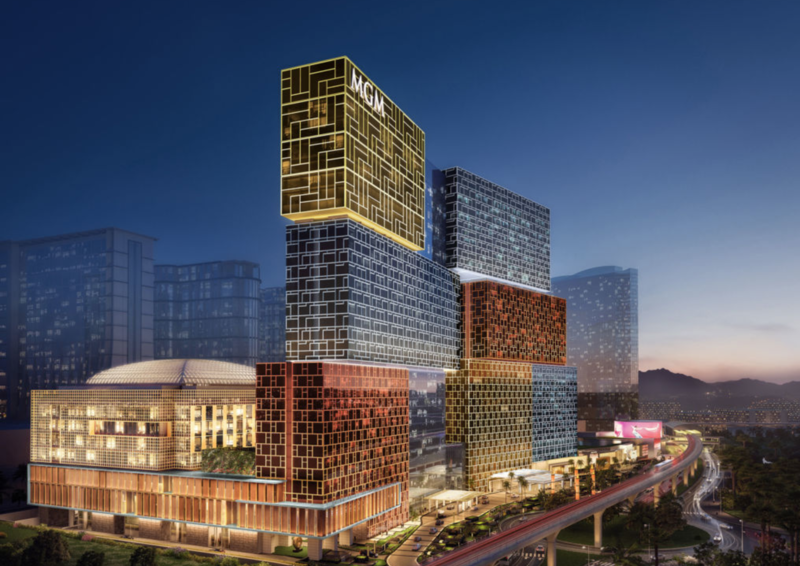 The timing is interesting, as the government licenses for Macau’s six operators to run the current casino oligopoly in Macau are after all set to expire in 2020 through 2022. As the Bloomberg article points out, “in theory” that could open the Macau market to more competition. Most though expect the Trump Organization is simply protecting the use of his brand rather than seriously contemplating a serious bid to enter the Macau market. Time will tell! The new trademark applications are the same as those previously applied for and granted in Macau back in 2006 and lapsed this year. There are currently no Trump-branded businesses in Macau. And since winning the US presidential election, Mr Trump has turned over control of his business empire to his children and said he will conduct no new foreign deals for his business while in office – still with Mr Trump, never-say-never. The reality is though that Mr Trump would find entering the Macau market an uphill battle. The authorities that really control the allocation of the licenses in Macau are more interested in working with operators who are willing to play by their rulebook, which in large part is running those casino operations in Macau to keep money flowing into the region, but not too much flowing out. Protectionism is also on the rise in Macau gaming, with restrictions preventing foreigners working on the gaming tables. There are also far more successful operators in the space than the Trump Organization, with more recent and relevant track records in the casino development space. That of course includes our three existing exposures in Macau whom have poured billions into developing integrated resorts that match authorities’ intentions to try and tilt the development towards Macau to a more family friendly destination. China has benefitted greatly from the decade long investment of MGM, Sands and Wynn to bring a Las Vegas feel to Macau, shifting its reputation from a shady VIP destination to one that holiday makers can come to have a punt, eat fine food, shop and enjoy sleeping in some of the best hotel rooms around. VIPs continue to provide most gaming revenue, but the mass market gaming share has increased from 30% five years ago to 42% according to the Macau Gaming and Inspection Bureau. 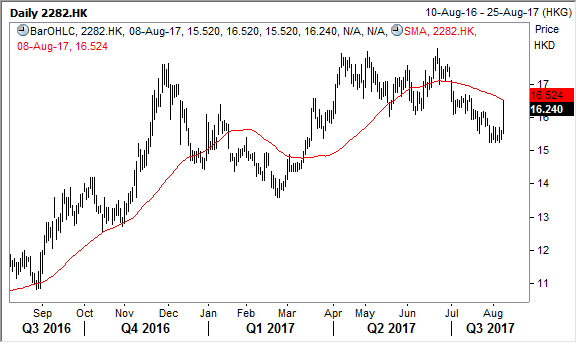 The shift will continue and is working, but take time to unfold due to the vast size of the Macau gaming market. Various infrastructure projects, along with new casinos and growing outbound travel from the Mainland all bode well. The bottom line in our view is that Chinese authorities will stick with the status quo in Macau rather than inviting any other foreigners to join the party in Macau, and will have an “if it ain’t broke, don’t fix it,” approach. For MGM, Wynn and Sands that is good news. Disclosure: The Fat Prophets Contrarian Fund declares a holding in Bolsas Y Mercados, MGM China, Wynn Macau and Sands China. Next PostNext War, what is it good for?